This is a selection of the brand and design projects that I have helped my lovely clients with. Everything from Logo’s and Graphic Design, to Website Design, Packaging and Label Design, Book Design, Social Media Design, Signs and Large Format Graphics and Marketing Support and Strategy. I you like what you see get in touch to find out if we are a good fit for each other. See my About Jason page to find out the types of people I LOVE to work with. Stroud Tyre Company is a well respected local tyre centre in Stroud, Gloucestershire and the owner, Phil, contacted me after a personal recommendation to ask for help in creating a professional website for his business. Having had a mixed relationship with a previous website provider, leaving him with a website that was below par and too basic to attract interest, he was sceptical about website designers and developers. I created a brand new website using the Squarespace platform that was both bold and engaging to create an instant and positive impression with visitors to the site. Squarespace website design and brand consulting. White Stones is a unique tourist development in the Island of Portland in Dorset UK. 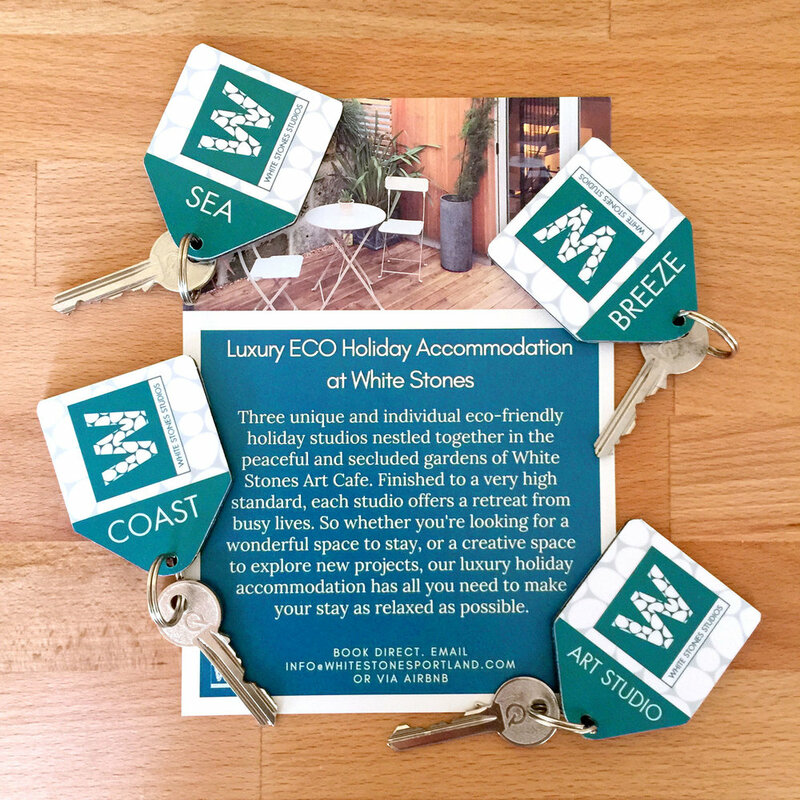 White Stones Art Cafe is a Cafe and Art Gallery, with a sculpture garden and White Stones Studios is a development of luxury eco studio accommodation. I helped David, the director, to rebrand his business and incorporate the new venture into his brand, create a brand new website to promote both ventures and design marketing materials and signs, as well as being on hand with marketing support. 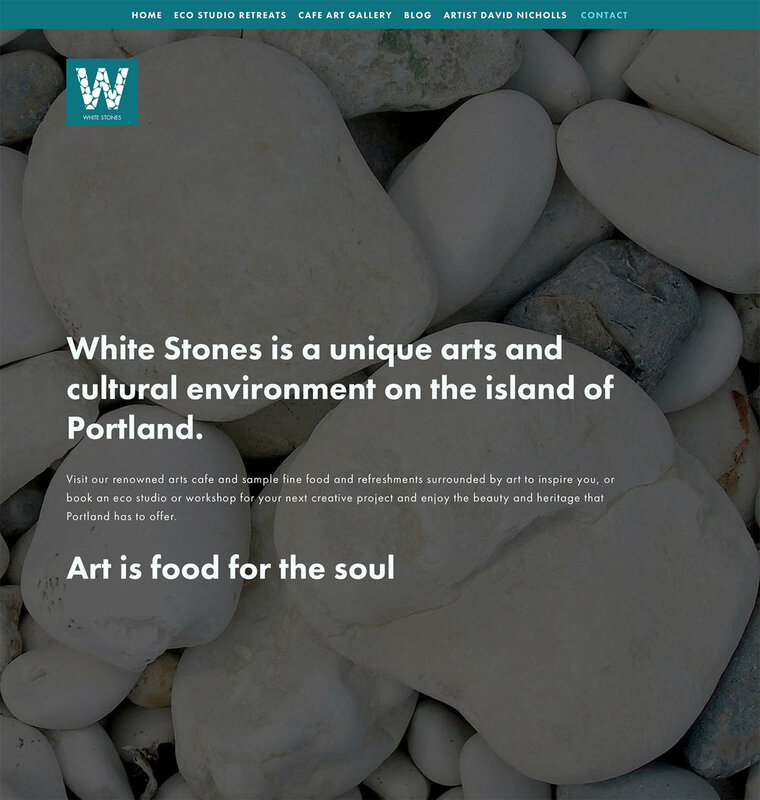 Head over to the White Stones website to learn more about Davids businesses. Key Tags are a great way to raise brand awareness. Gift Vouchers create customer loyalty. Lynsey Wellington is a highly qualified mindfulness coach working in Gloucestershire and across the South West. She got in touch after a recommendation needing help to get her website redesigned and a brand identity to be created to properly represent her brand online. I created a Squarespace website for her and a clean and stylish logo. I also help Lynsey with branding and marketing support. Squarespace Website Design and 1-2-1 training support. Squarespace website design with image sourcing and project management. Steve got in touch after a personal recommendation. His website at the time was broken and very outdated. I created a brand-new Squarespace website to professionally represent his company online, as well as sourcing images and graphics and he’s delighted with the result! Steve received 1 hour of Squarespace training, provided by me and he’s thrilled at just how easy the new website is to manage. Anna Rae-Jones is a connection coach providing 1-2-1 coaching, workshops and talks across Gloucestershire and beyond. She got it touch for help to brand her new business venture. This was a wonderful project to work on and a very different process to the standard projects I undertake for clients, as the logo was designed during an interactive session with Anna and myself sketching out ideas and organically creating a finished logo. The Squarespace website was created by Anna during a number of 1-2-1 training sessions. Squarespace website created during 1-2-1 training sessions with client. I am a key member of The Gloucestershire Poetry Society and poetry is a passion of mine. I help the Society with strategy, organisation, branding and marketing. I designed the new website and have designed and self-published two anthologies and a poetry pamphlet for the Society. I successfully crowdfunded the Society’s first annual anthology and self-published the book. I also designed the book which celebrated the first anniversary of the Society and it's publication coincided with The Gloucester Poetry Festival, also organised by the Society. Squarespace website and brand consultancy. Book Design for Poetry Anthology. Crowdfunded and printed in the UK. Gill Kirkham is a Facilitator and Coach based in Cheltenham Gloucestershire. Gill asked me for help in designing a corporate brochure as a proposal for a new Workshop that she was providing. She had a short time frame to create the proposal so I stepped in to help produce a professional brochure to create the right impression and best present the content. Gill was delighted with the result and gave me a glowing testimonial. Judith, an old friend from when I used to live in Staffordshire, got in touch for help with branding for her new business venture. After a long career as a Mortgage Advisor, she took the plunge to set up her own business. I created a brand logo and business stationery, including a folder design. Judith Clayton, Director. House of Mortgages Ltd. I was asked to modify the School and Trust's existing logo's to give them a more current style as they had not been changed for many years. I redrew the logo's icon and matched the colours and introduced a more modern font. It was a pleasure to redesign the Trust's logo that had not been updated for many years. The Trust wanted a more modern logo to help reflect a more positive impression locally, in line with the Stoke on Trent City of Culture Bid 2021. The Angel is part of a local historical landmark in Burslem and was essential to include in the design to help give instant recognition to the location of the Trust. Olga is a highly respected massage therapist and she asked me for help to design a logo to represent her business professionally. I crafted her a new logo, business cards and flyer to help her promote her services locally across Gloucestershire. Brand Logo and Business Card Design. Renny got in touch as she needed a website creating to represent her business as a motivational coach. She had a basic single page site build with a domain providers basic website builder that looked dated and also a separate Wordpress blog. After a consultation I recommended that the new site amalgamated all of her services into a single website, with an internal blog. Sqaurespace was the perfect platform for Renny's new website as she needed to be able to update the site easily and quickly, and also have a mobile friendly website. As part of the project I designed Renny's brand new logo, business card and flyer. I have worked with Sally-Anne and Holly for several years, helping with website design, social media branding and more recently Squarespace website training and consulting to help them build a professional website. Most recently I worked with them to create a range of product cut outs for their new website. Jane is a sports therapist working in Staffordshire and approached me for help creating a brand identity for her business. She is self employed and needed an eye catching logo designing to help her business to be look professional. I have also helped Jane to get a Squarespace website designed as well as developing a range of product labels for her ethical beauty products. Most recently I designed a wow factor pop up banner to help get her business noticed. I have been working with Nicholas von Benzon at Cheltenham Mediation Services for several years, helping to raise the company’s businesses profile locally and regionally across social media channels. I have also created a new website and assisted with graphic design projects. Website redesign using the Squarespace platform. Rebecca needed a brand overhaul for her very popular IT shop based in Stroud, Gloucestershire. I created an eye catching brand logo to help her business stand out and be noticed locally. The project developed into a full stationery redesign and also the design of the signage for the shop front. Rebecca, The Web Works Stroud. Signage design for new shop frontage signs. Pete and Lynn first got in touch when they needed help to create a first website for their Cheltenham based cleaning business. I was also asked to help with SEO and social media management to help spread the word about their cleaning services to Cheltenham offices, rental properties and homes. As they only covered the Cheltenham area my task was to use social media and SEO to create local interest and to ultimately generate new business. I've been working with the couple for many years and they really are fantastic clients to work with! Squarespace websites automatically adjust to fit any device and are super easy to update and manage. Debbie and Jan came to me for help through personal recommendation. After having a new website produced that crashed their Google ranking to the floor and lead to a big reduction in income and bookable work, they got in touch initially for SEO advice and I was thrilled when they agreed to let me create a new fully scaleable responsive website for their business. I helped to produced a Squarespace website that's search engine friendly, adjusts to fit any device, ranks highly and funnels new visitors to their website thats super easy for them to manage. "We are delighted with the website and marketing services provided for us by Cre8urbrand. Jason is exactly who we needed: professional, ethical/honest and straightforward, he delivers what he promises to a very high standard and goes the extra mile to help where he can. We cannot recommend him highly enough." Responsive Wordpress ecommerce website design and development. I got in touch with Verity at Verité Louise after finding her website through Facebook (which was a basic single page at the time) to let her know that I would love to create a beautiful new website for her that would demand attention and shout about her brand. After getting to know her brand and business inside out I crafted a fabulous on trend bespoke responsive website for her. She was passionate about having a leading and stylish website that would stand above her competitors locally and nationally. After two great years working with verity, she closed the business due to an exciting career change, which mean't a fond farewell to the website! This was a multi award winning website winning both the Gloucestershire Echo Love To Shop Awards 2014 for best website and being selected as finalists in the Stars Underlines national trade awards 2014 for best website. Two fantastic achievements for an independent retailer in the lingerie and swimwear market and I was thrilled to be a part of the journey. Martha Mary is one of my longest service clients since my first steps as a freelance designer back in 2002. 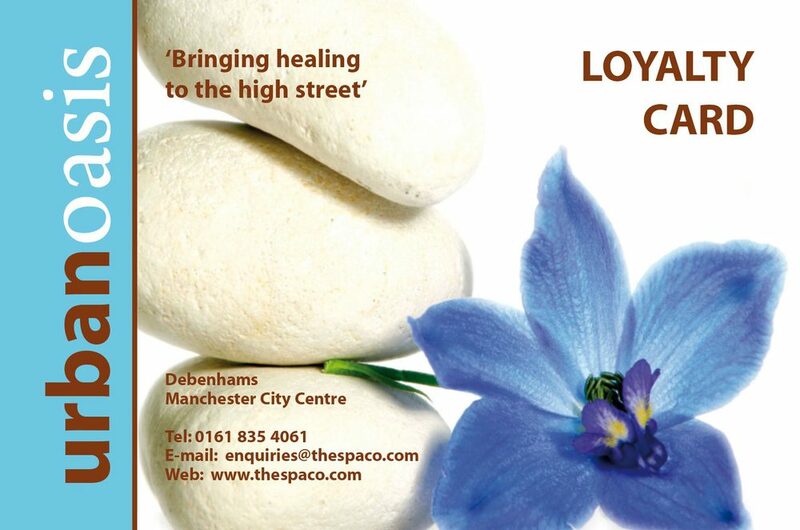 She runs a successful spa therapy and beauty company based in Debenhams Manchester City Centre. Since the early days of graphic design support, I have helped to create a welcoming and inviting brand which has emerged as a leading spa in Manchester. I’ve lovingly created branding, signage, packaging and labels, stationery, photography and a huge range of marketing media for the company over the years, as well as helping with brand strategy. I'm super thrilled to have become their marketing advisor, helping them to grow as a business with strategic advice. "I have been very impressed with how conscientious Cre8urbrand is in all spects of the work and most importantly, the way in which they communicate regularly with us as a customer. I always know how things are progressing and when delivery is expected etc." Loyalty Cards help to incentivise customers. Brand Guide for external agencies and suppliers.